See the clip in Ella's hair? That same clip has stayed in all day long. For our super-fine hair this is a real accomplishment. The secret? Good ole' Karo syrup. Felt like 1979. I plopped a little on her hair, made a gooey mess, and clipped away. If you look closely it does look like she put a sucker in her hair, but most people admire from afar so we figured we're safe. High-fructose saves the day. See the octopus sprinkler? $5 at the DownEast Home tent sale. Originally $59.99. What a steal. Summer...we're ready. Yes, I am fan of Karo syrup too. It washes out so easily too. That is too funny! I love it! 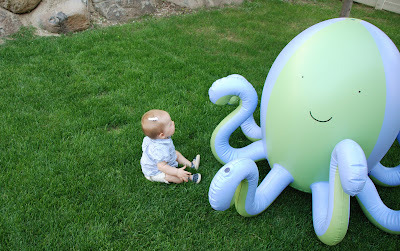 What a great find the octopus is! I expect to see a video of her playing in it later this summer! She looks so little sitting next to it....so cute!